This story was updated at 3:25 p.m. EDT. NASA's first commercial cargo flight ended with a splash today (Oct. 28), when the SpaceX Dragon capsule landed after a landmark mission to the International Space Station. The unmanned Dragon space capsule, built by the U.S. company Space Exploration Technologies (SpaceX), splashed down into the Pacific Ocean off the coast of Southern California at 3:22 p.m. EDT (1922 GMT), ending a three-week visit to the orbiting laboratory. 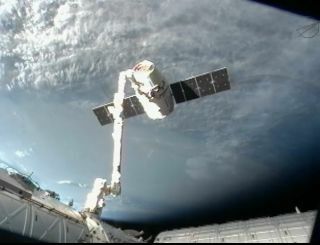 Dragon began its descent with a de-orbit burn at 2:28 p.m. EDT (1828 GMT), after departing the station at 9:29 a.m. EDT (1329 GMT) as both spacecraft sailed 255 miles (410 kilometers) above Burma. The station's crew used the outpost's robotic arm to release the spacecraft. The spacecraft is expected to be retrieved by a SpaceX recovery crew so the cargo can be delivered to NASA. The mission is the first of 12 commercial resupply flights by SpaceX under a $1.6 billion deal with NASA. The Hawthorne, Calif.-based SpaceX (short for Space Exploration Technologies) launched the Dragon capsule toward the space station on Oct. 7 using one of the company's own Falcon 9 rockets and a pad at Florida's Cape Canaveral Air Force Station. The capsule was packed with 882 pounds (400 kg) of supplies to for the station, including 260 pounds (117 kg) of crew gear, 390 pounds (176 kg) of scientific equipment, 225 pounds (102 kg) of hardware and several pounds of other cargo, NASA officials said. The cargo returning home on Dragon are 163 pounds (74 kg) of crew supplies, 866 pounds (392 kg) of scientific research and 518 pounds (235 kg) of other hardware, they added. The unmanned cargo ships built by Russia, Japan and Europe are all designed for one-way trips and are intentionally destroyed during re-entry at the end of their missions. The Russian Soyuz capsules that ferry crews to and from the space station have limited cargo return capabilities, NASA scientists have said. SpaceX was founded by billionaire entrepreneur Elon Musk in 2002 as a private spaceflight company. In May, the company launched its first Dragon capsule test flight to the space station to set the stage for this month's first cargo delivery flight. The next Dragon cargo mission is slated to launch in mid-January.